강화 전등사 목조지장보살삼존상과 시왕상은 조성원문을 통하여 숭정(崇禎) 9년(1636)이라는 뚜렷한 조성연대를 알 수 있을 뿐 아니라, 대웅전 목조석가여래삼불좌상이 조각승 수연(守衍)에 의해 조성된 지 13년이 지난 뒤에 역시 수연이 수화승이 되어 제작한 상들이다. 지장보살상과 그 좌우에 무독귀왕, 도명존자, 시왕(十王)와 귀왕, 판관, 사자상, 동자상, 인왕상 등 명부전의 권속이 많다보니 조각승도 12명이나 참여하여 수연의 지휘 아래 제작을 맡았던 것으로 보인다. 또한 이 상들의 조성을 위한 시주에 수많은 신도들이 참여한 것으로 보아 당시 전등사 일대의 대대적인 불사(佛事)였음을 짐작할 수 있다. 지장보살상은 방형의 얼굴에 엄중하면서도 자비로운 상호(相好)를 보이며 양 어깨에 걸쳐진 대의 옷자락은 유연한 주름을 이루며 하체로 연결된다. 양손으로는 지물을 들지 않고 엄지와 중지를 맞대어 설법인을 결하고 있는데, 전체적인 비례와 조형감이 우수하다. 지장보살상과 매우 유사한 특징을 보이는 도명존자상은 얼굴표현에서 사실성이 돋보이며, 장삼위에 가사를 입은 착의형식이 단정하다. 수연 조각의 특징을 가장 잘 보여주는 지장보살상과 도명존자 외에도 시왕상과 기타 권속의 여러 상에서 보이는 인간적이면서도 차분한 분위기는 수연 조각의 특징을 잘 나타내고 있다. 조각기법상의 우수성, 조각가와 조성연대에 대한 분명한 기록, 원래부터 전등사 명부전 봉안을 위해 조성된 상이라는 여러 점에서 볼 때 그 가치가 큰 상들이다. 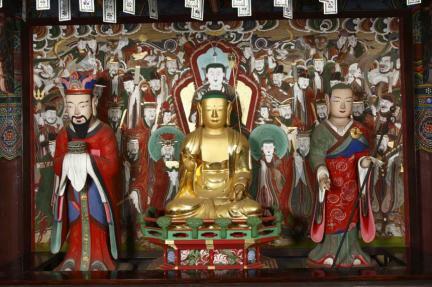 These wooden statues of Buddhist deities, saints, and their dependents, all of which are enshrined in Jeondeungsa Temple in Ganghwa, were made in 1636 by a sculptor and Buddhist monk named Suyeon who also carved the Wooden Seated Buddha Triad enshrined in the temple’s Daeungjeon Hall thirteen years earlier. 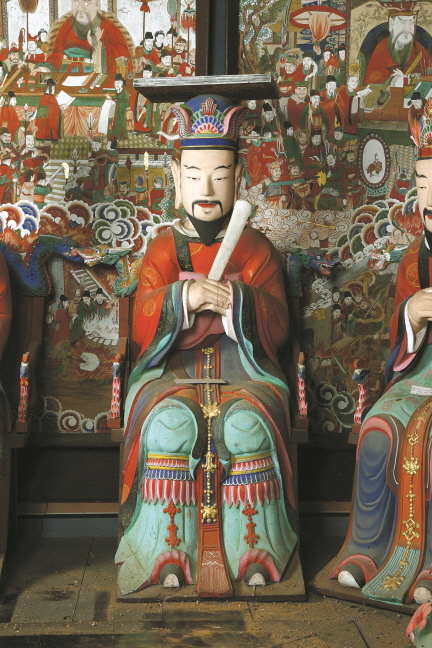 He formed a team of twelve monk to assist him with the carving of the Ksitigarbha, which is flanked by two acolytes, Ten Underworld Kings, Devil Kings, Judges, Lions, Children, Vajradhara, and other beings enshrined in Myeongbujeon Hall. Records say that the project of enshrining the statues required the participation of a large number of worshippers and alms givers, suggesting that it was a major festive event held in the area around Jeondeungsa Temple. The statue of Ksitigarbha Bodhisattva is characterized by a highly refined sense of proportion and balance. 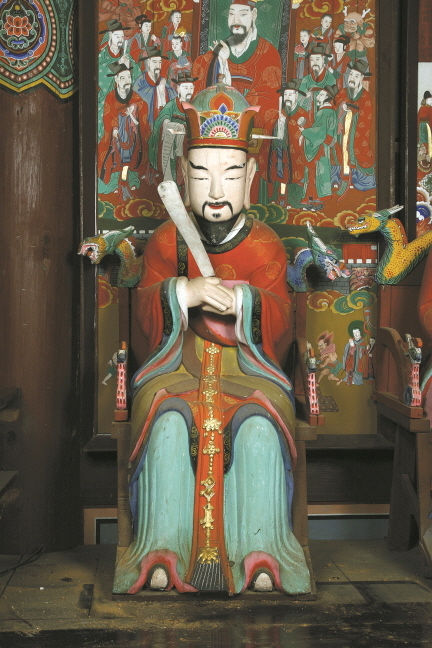 His attendant, Domyeong, also displays similar characteristics, including a realistic depiction of the face and the upper robe worn neatly over the monastic robe. 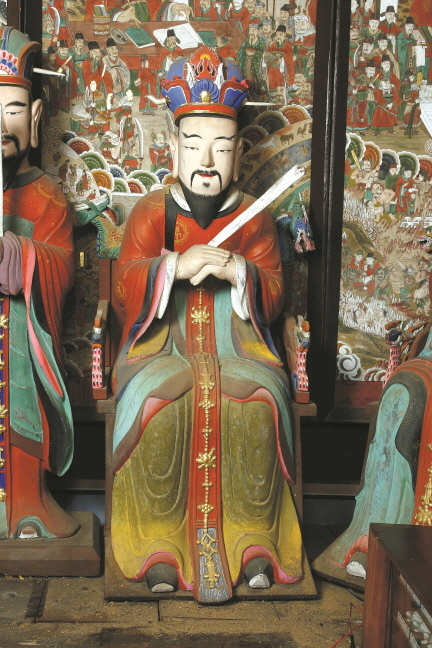 Other statues, including the Ten Underworld Kings, also clearly show the characteristic features of a wooden sculpture carved by Suyeon. 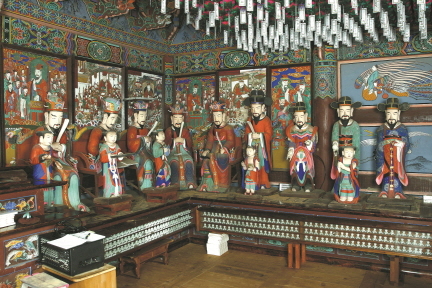 These Buddhist statues are regarded as valuable Korean Buddhist heritages not only because of their artistic excellence but also because there are clear records of when and by whom they were made and because they are still kept in their original location, Myeongbujeon Hall of Jeondeungsa Temple, performing their original function.